"If you haven't been to the Blue Door, you haven't been to Budějovice". At least that's what it says on their blackboard. And as one of the city's most popular and long serving restaurants, they have as much right to make the claim as anybody else. You'll find the Blue Door Restaurant just a few metres down Biskupská ul, which is one of the side streets that leading off the corner of the square near the town hall. Look for a sign in the shape of a small blue door hanging above the footpath. 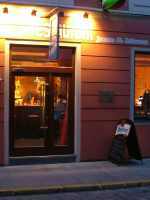 The Blue door's full name is Modrý Dveře Jazz and Blues restaurant. There's a piano bar every Wednesday and a live band every Thursday night. The rest of the time it operates a cafe, restaurant and bar. Inside the main front door is the bar with space for about twenty people around six or eight tables. Further to the back are two more rooms and right At the back is a small courtyard with tables and chairs set up for dining under leafy trees and big green umbrellas. 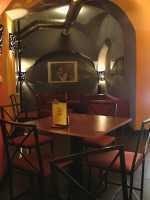 The menu offers a good choice and the prices were the best value that I could find in České Budějovice. 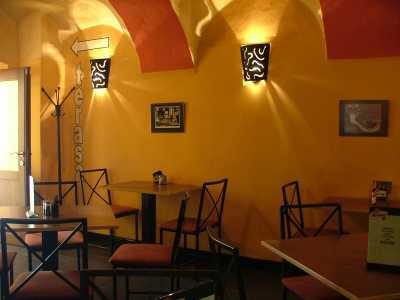 On the main menu there are main-course salads on offer for 80-95Kč, baked potatoes for 95-100Kč, a 400gram chicken burrito for 95 or a 400g vegetarian quesadilla for 85Kč. The beer on tap on tap is Pilsner Urquell and goes for 28Kč a half-litre. I had a large glass of soda water for 25Kč and a large coffee with milk would have been 30Kč. (Prices correct June 2009). During the week they offer lunch menus starting from 60Kč, which is as cheap as you're likely to find anywhere. Ordering is a little different to other times though. There is no table service between 11am and 2pm-orders are taken and paid for at the counter. You then take your drink, find a table and wait for the waiter to bring your meal. There's also no smoking until after 2pm. There seem to be 7 or 8 things on offer each day, but by the time I arrived around 12.30 five of them were already sold out. From the options remaining, I chose fried hermelin cheese with cranberry sauce and french fries for 80Kč. If I'd been earlier I could have had a pork cutlet with potatoes also for 80Kč or a chicken fillet with wedges for 85Kč. With a lunch special, bottomless glasses of soft drink (or soda water) are 25Kč. The Blue door is open seven days a week from 10am to midnight and if you've been there you've definitely been to České Budějovice.